The following information are the different exchange lists our club has to offer, have a look and see which list/lists are right for you. When you have decided contact (Mrs) Mickey Woodcock ukstampnet@aol.com to join our club. 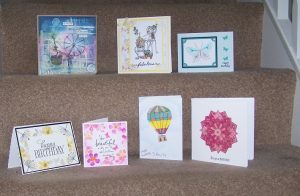 Everyone likes to be remembered on their birthday and wouldn’t it be great to fill your mantelpiece with beautiful handmade cards. 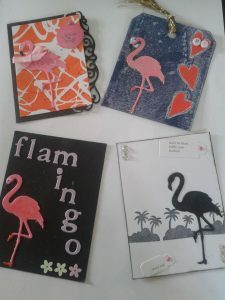 You can make a card of any size and any description. You must make a card for everyone on the list. RAK or random acts of kindness are any type of greeting card of any theme and any technique. RAK are a great way of exchanging ideas and trying out new techniques and textures. 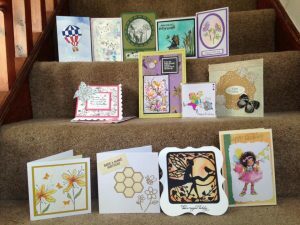 This list is good for stampers who like to make and receive cards. If you don’t like making cards this list is not for you. The card you send can be any size or shape but it must have some aspect of stamping on the cover. After you have made the card you send it to another member on the RAK list. When you receive a card that is made for you , you make a card for the sender as a way of saying thank you (but the card doesn’t actually have to say thank you on it). Then the person who sent you a card makes and sends you a card so the cards keep going back and forth. Make sure you sign your name on the card somewhere so the receiver knows who it is from. You must make a card for every member on the list. We all love getting free crafting items. These days on the cover of most paper craft magazines you’ll find a free gift of some sort, or maybe you won something in a craft competition. As long as you didn’t pay for it, it qualifies for this list. The idea is to gain some inspiration using someone elses freebie. It can be any craft item you got for free, an embossing folder, stamp, die, some product like glitter, backing paper, beads, die cuts, stickers. You are making a book for yourself so you will get the item you put in (embossing folder, stamp, die) back. Please make sure you are putting in enough for 4 participants. If you put in product (backing paper, glitter, beads etc. then the recipient will use up whatever you put in. **Not putting an item in the bag doesn’t allow for as much of an opportunity for the participant to use what ever technique they would like. If you include the item in then it allows the participant to use the item to put their own style to what they make. Take a piece of cardstock and measure it to 8 1/4 X 5 1/2 inches or 21 cm X 14 cm. Once you have done that turn it landscape and make a score line at the 4 inch point and then again at the 4 1/4 point. Or if you are working in cm then score at the 10cm point and again at 10.7. Now you have created a spine. Next attach a piece of ribbon on the front right hand side and the back left hand side then place a piece of backing paper over the ribbon end that you have attached to the book in order to tie it together to close it. On the front of the book create some artwork using the item you are giving the other 4 participants to use. Attach a plain panel on to the back cover which needs the following information on it. 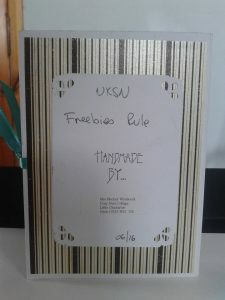 UKSN Freebies Rule Book, Made by (your name and address) and the date. On the inside take a celo back that you would use to cover a card for sale and fold it up to the opening then seal it. Make two of these and attach it to the inside of the book. One bag is for what you are giving away, the other bag is for the artwork that people have made with the item you gave them to use. With the artwork side the idea is to use 4 different techniques with the same item to inspire the recipient. You can use any medium you choose and of course you can add anything else to your artwork. If you don’t know what an ATC is, it stands for Artist Trading Card. t’s a tiny piece of artwork with a standard size of 3 1/2 by 2 1/2 inches or 9 by 6.5 cm. What’s good about them is you can get as arty as you like with them, stick things to them, embellish them as you like. When it comes to making ATC’s despite the fact that we are a rubberstamping club we relax the rubberstamping rule that we have with the other lists. So feel free to use any medium you choose, decoupage, parchment, needlework. As long as it fits on a 2 1/2 by 3 1/2 card it works as an ATC so let your artistic mind run wild. There are lots of style books you can make to hold ATC’s but the easiest is the concertina style. Take an A4 piece of cardstock and cut it in half lenghtwise then fold into four so that each section is slightly larger than an ATC. Stick your ATC to the front and on the back write UKSN ATC Book, made for:, made by:, and the date. It’s a good idea when making a book to put your own address somewhere on the book just in case it some how fell out of the envelope while being in the hands of the Royal Mail, with your address on it you stand at least half a chance of getting it back. If you prefer a book with a spine then take an A4 piece of card stock and cut it in half width wise, put 4 pages on the inside to form the book and on the inside cover write the information. It’s so much fun to get something for free and this is what this list is all about. We all have loads of embellishments hanging around in our craft rooms/spaces. How about giving them a new lease of life. This list is called Four or More because you are going to put 16 of the same embellishments into 4 small ziplock bag or a sealed atc sleeve, attach them to the inside of a concertina style book and when the book is full you will receive lots of different embellishments to use any way you choose. It’s ok to put in one large embellishment, four medium size or quite few tiny embellishments. Say your choice of embellishment flowers, if it is a large flower that fits into an atc size bag then you need only put it one, if they are smaller then put in 4 but if you choice of embellishment is sequins, beads or buttons then you will need to put in several. Basically you want to put in enough to make one card with. There is no obligation to make any thank you cards with the embellishments you receive. 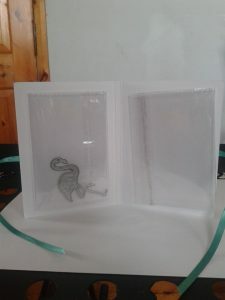 You will be making a book for yourself, so to start a book cut an A4 piece of cardstock in half the long ways fold it into 4 to make a concertina style book. On the back you write UKSN Four or More book, your name and address and the date. On the inside of your book attach 4 of the same embellishments bags, one per section. You can put any kind of embellishments in the bags except peel offs, this is a peel off free zone. Then the book goes round to the other members on this list and when the book is filled it is sent back to you and you can use the different embellishments you receive any way you fancy. Embellishments are anything you would use to decorate you artwork. Flowers, die cuts, glitter, beads, ribbon, epoxy stickers, buttons etc are all classed as embellishments. You can make as many books for yourself as you want, the more books you make the more embellishments you will get back to decorate your artwork with. It’s a fun way to broaden your embellishment stash.